It is well known that patients with haematological disorders are at high risk for developing infections caused by different fungi. Part of this is due to the inherent immune system defects that develop as a consequence of their haematological disorders, but the greater part of the risk can be attributed to the treatment that they receive in an attempt to cure them of these haematological disorders, which result in varying degrees of immunosuppression. 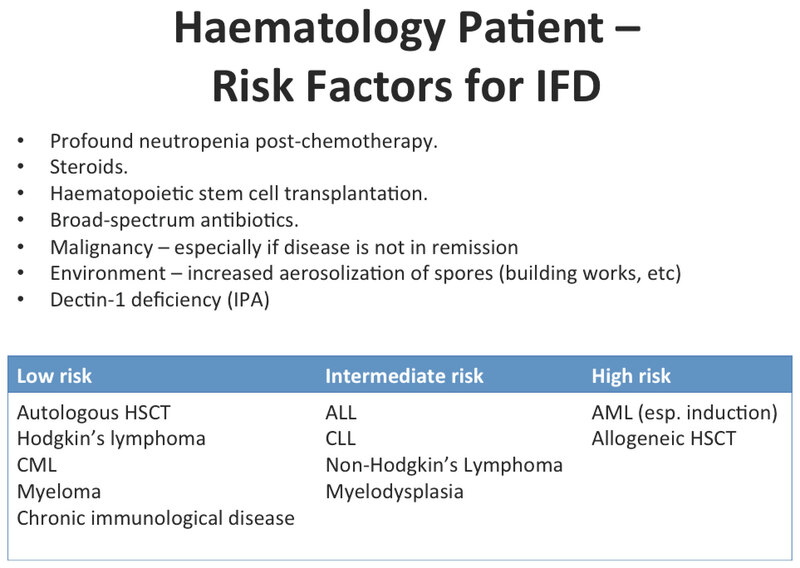 Risk factors for invasive fungal diseases in patients with haematological disorders (adapted from Pagano L, et al. J Antimicrob Chemother. 2011;66:i5-i14. Doctors had become more aware of mould infections, and were therefore diagnosing them more frequently. Since 2003, the availability of the galactomannan test also facilitated the diagnosis of Aspergillus infections – the most common mould infection. More patients were surviving their Candida infections and underlying haematological disorders long enough to get mould infections. Perhaps most importantly in recent times, doctors had started to prescribe prophylaxis against Candida infections routinely ever since landmark studies published in 1992 showed that fluconazole not only reduced the incidence of invasive candidiasis, but also reduced infection-related mortality and improved overall survival in patients with haematological disorders. Now, invasive fungal infections in patients with haematological disorders are not easy to diagnose (relative to bacterial infections, for example), even with molecular and immunological tests. One reason is that many fungi are more fastidious than bacteria and therefore grow poorly in the microbiology laboratory. Also, moulds – unlike Candida spp. – tend to cause localised infections (i.e. of the lungs or sinuses), and the main way to confirm the infection is to take a piece of infected tissue for microscopy and/or culture. Which tends to be extremely difficult to do in patients with haematological disorders as most of these patients who are at risk of fungal infections are also concurrently thrombocytopaenia, i.e. their platelet counts are low and the risk of bleeding with invasive procedures and biopsies are high enough that these are seldom attempted. 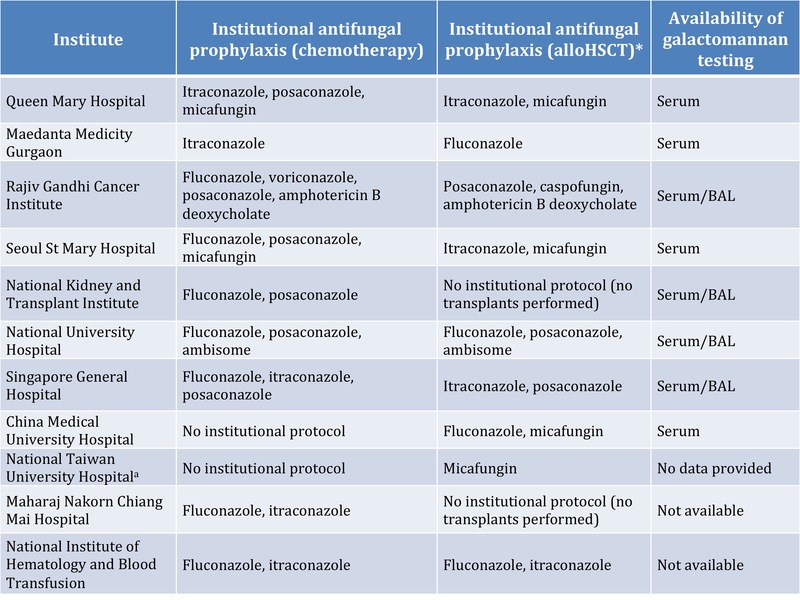 In order to standardise the reporting of such infections, the European Organization for Research and Treatment of Cancer/Invasive Fungal Infections Cooperative Group and the National Institute of Allergy and Infectious Diseases Mycoses Study Group (EORTC/MSG) Consensus Group came up with standard definitions for possible, probable, and proven invasive fungal infection, and these definitions were last revised in 2008. As I had previously mentioned, most of the data on such infections had come from the U.S. and Europe. 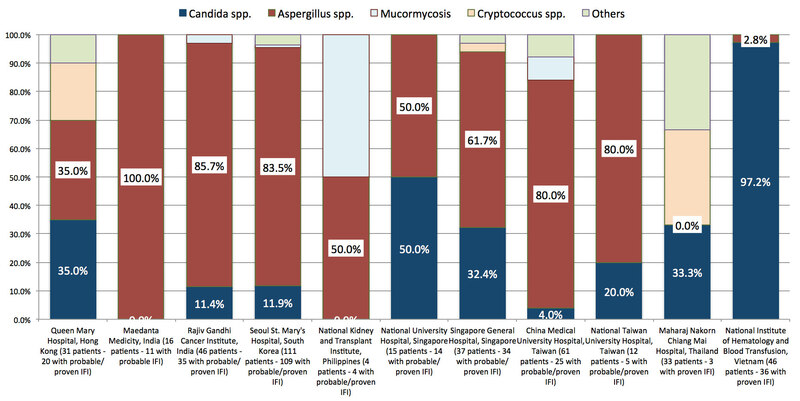 There was a dearth of data from Asia (except for Japan), and we felt that it would be of interest to determine whether fungal infections in haematology patients in Asia would be similar to their counterparts in Europe and the U.S. In particular, researchers from India like Prof. Arunaloke Chakrabarti had described the emergence and rise of infections by Zygomycetes – a large group of environmental fungi that can cause the devastating disease mucormycosis in susceptible humans – in different parts of India, and we wanted to determine if this phenomenon was also present in Indian patients with haematological disorders. After a 2-year recruitment period, and using definitions provided by the EORTC/MSG, we found – perhaps unsurprisingly – that the Asian data and results were remarkably similar to European and U.S. results. There were a total of 412 patients recruited, the majority of whom had acute myeloid leukemia (AML), had received chemotherapy prior to the infection, and were neutropaenic at the time of the fungal infection. The majority had probable (38.3%) or proven (33.5%) invasive fungal infections, of which Aspergillus spp. (65.9%) and Candida spp. (26.7%) caused the bulk of the infections. Just under a quarter (22.1%) of the patients died within 30 days of diagnosis of the infection. Patients with invasive candidiasis (virtually all bloodstream infections) were more likely to die compared to patients with other types of fungal infections. Distribution of haematological disorders among the 412 patients with invasive fungal infections. There were significant differences between the different institutes, however, in terms of the type of invading fungus identified (Figure 2). These differences quickly become understandable when one looks at the availability of galactomannan testing in the different institutions, and which institution tests – as a further diagnostic step – for the presence of galactomannan in bronchoalveolar lavage (BAL) washings. The lack of availability of the galactomannan test (Thailand and Vietnam) severely hampers the ability to diagnose invasive aspergillosis. Institute-level antifungal prophylaxis protocols as well as availability of galactomannan testing. BAL = bronchoalveolar lavage. The short conclusion after two years is that the epidemiology of invasive fungal infections in patients with haematological disorders in Asia – at least in the institutions we sampled – is similar to other U.S. and European centres. Aspergillus spp. and Candida spp. are ubiquitous fungi, and are equally prevalent in tropical as well as temperate climates. The patients also go through a similar “path” in terms of hospitalisation for chemotherapy and/or haematopoietic stem cell transplantation. Unfortunately, the institutions that participated very different in terms of the size of the haematological units, capabilities, and treatment/diagnostic resources, which prohibits any real generalisability and limits the meaningful conclusions that can be drawn. But nonetheless, it still seems to be a useful snapshot of fungal epidemiology in the region.